Apples, bananas, and watermelon might all seem like healthy snacks, but many nutritionists recommend that we remain cautious about our fruit intake. "Sweet fruit is loaded with sugar," says nutritionist and Byrdie health guru Kelly LeVeque. "Fructose effectively stores as fat and glucose that can negatively affect blood sugar regulation." Doesn't sound so healthy. That said, because every dietitian's philosophy differs slightly, there is no conclusive answer to the question, "Is fruit healthy?" However, there exists one fruit that nutrition experts from every background can agree on. Last month, we asked a group of 17 different dietitians to name the top three healthiest foods on earth and cross-referenced their answers. (Unsurprisingly, avocado and leafy greens topped most lists.) Despite any debate about how much fructose a person should consume, the majority of nutritionists called out the following fruit as one of the world's top nutrient powerhouses: Blueberries. Keep scrolling to learn why this itty-bitty fruit is one of the healthiest foods you can eat. Q: Why are nutritionists so in love with blueberries? We all have a vague idea that blueberries are rich in antioxidants, but what exactly does that mean for our health? "[Blueberries contain] at least 15 different types of … potent antioxidants that protect virtually every system in the body," says nutritionist Michelle Babb, author of Anti-Inflammatory Eating Made Easy. "Antioxidants guard against damage to cells, tissues, and muscles and are important for cardiovascular health, brain health, and exercise recovery." "If you are going to add one fruit to your diet, make it blueberries," agrees Frida Harju, the in-house nutritionist at Lifesum. "They have been labeled a superfood due to their high levels of polyphenols, antioxidative, and anti-inflammatory compounds that … help to combat memory loss and enhance your mood." Not to mention blueberries are excellent for weight loss—"even as part of a low-carb diet," says Colette Heimowitz, VP of nutrition and education at Atkins Nutritionals. Unlike some other fruits, blueberries have actually been shown to improve people's blood glucose and insulin levels, Heimowitz says. Plus, they are low in calories, but they are high in fiber and flavor. You'd be hard-pressed to find a nutritionist who isn't in love with them. 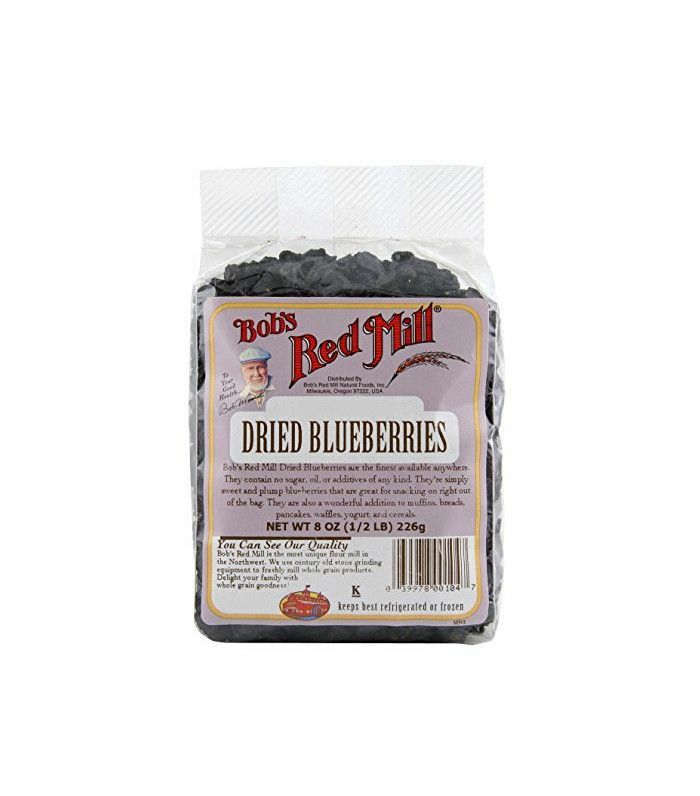 Reap the benefits by snacking on some dried blueberries like the ones below. Next up, enjoy our favorite sugar-free dessert recipes.